Quilt show season has arrived, and I was considering attending one of the national conventions to meet up with some friends and wallow in fabric. It's always a bit dangerous for me to go to the big shows, as there's always so much I want to buy, and I really don't have the money to splurge on anything. I managed to talk myself out of it after I sorted through my fabric stash last week; I probably have enough fat quarters and yardage to circle the planet. I'm also just now getting over the last dregs of my URI and I don't want to risk being infected by some sniffly attendee who should have stayed home. So this year I'll probably just go to the county quilt show next month and let that be enough. The little china cup pincushion on the right is one I made myself. I got the cup from a thrift store and used some scrap fabric, a handful of fiberfill and my hot glue gun to make it. It turned out so pretty I hardly ever use it. I needed some short pins for some binding, though, so I grabbed it off the shelf where it lives and impresses everyone with how organized I am (not). This pincushion really symbolizes the sewer I wish I was: elegant, tidy, and always attractively engaged. The sugar bowl pincushion on the left is one I bought from Kathy at Strange Notions, who also made it. It's my favorite "work" pincushion that is always parked at my elbow, and it's been working overtime since it arrived at Casa PBW. The dogs knocked it over and broke off one of the handles, which I then imperfectly glued back together. It's riddled with dressing making pins, and big pins for heavy-duty work, and at least one of each type of hand-sewing needle I use. It also guards my favorite thimble. This pincushion really shows the sort of sewer I am while I work: busy, untidy, and indifferent to appearances. I admire the "order" pincushion -- it reflects the ideals all those quilting books and shows tell me I should strive for -- but I love my "chaos" work pincushion, because like me it isn't perfect. Organization is wonderful, but creation itself is often a messy business. Don't kick yourself if you don't work in an atmosphere of 24/7 pristine perfection. I think the key to working well is to be comfortable in your work space, which is something only you can define. If that means embracing a little chaos over order, go for it. Chaos. I embrace it. And then I embrace order. They're both necessary to me. I think you know what my husband does. Builds the Corvette motors for the LeMans GTLM series. They're moving to a new facility and People (what a dumb name for a department) came in and drew little circles and squares on their benches for their laptops and coffee cups and everything has to be there at the end of the day. These are creative people. What the heck are TPTB thinking??? Not going to happen which is only going to cause problems but come on. Really? That's such a great idea! So pretty and practical. 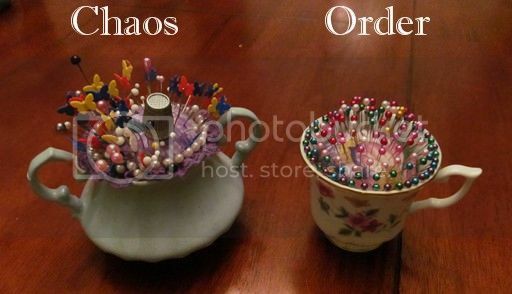 Oddly, I look at the teacup pincushion not as organized, but unused. Cherished for beauty over utility. A workhorse has scars as the teapot pincushion can testify. I love your teacup, and the organisation of it, but I'm definitely the sugar bowl when it comes to sewing.